This summer seems to have had the usual variety of such critters. Here’s a quick overview of some notable ones of late. Made fantastic by the mainstream media and social media, these “monsters” are normal species that happen to not be living any longer. 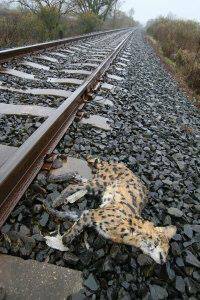 A dead serval was found near railroad tracks in Hungary. People do keep pets. Legally. Illegally. Sometimes they escape. Sometimes they get hit by trains. Sad. But true. A raccoon dog (Nyctereutes procyonoides) was discovered dead in Belarus. Raccoon dogs exist in the wild. They die. 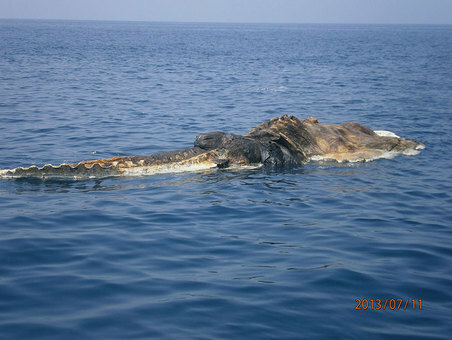 Probable death whale found floating in the ocean caused some silly things to be said by some. 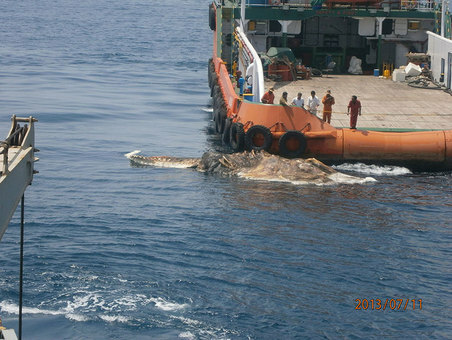 Dead marine animals float, sometimes. 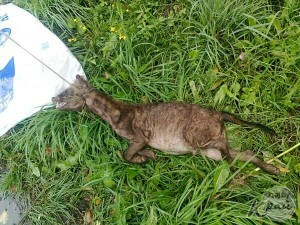 What have been your favorite “dead animal” finds for the summer of 2013? If things carry on warmin’ up at the rate some say Loren then this sort of thing’s only go’n'o become all the more common. But whatever’s driving the likes of the mangy foxes and squirrels me an’ our Kid’ve independently seen wand’ring round Liverpool City centre’s also ultimately go’n'o increase the possibility of cryptids being run over in the middle of New York Moscow or Rio de Janeiro. In which case it’s good to strike the balance between alerting only semi repentant distinctly unrustic city dwelling idiots like myself to possible misidentifications of the common we might make and making us feel TOO foolish about our ignorance just in case one day one of us actually ends up depositing the remains of a genuine chupacabra-Bigfoot cross in the bin rather than run the risk of being mocked. It shows how more and more unnatural city dwellers lives’re becoming though and once Google Glass and its descendants become the norm how many of us will ever look directly upon the real world ever again? Boom! And Loren drops the mic and leaves the stage. As usual with our host, credulity is defeated by an understanding of reality. 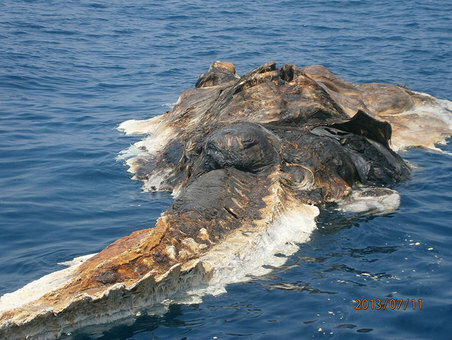 Though I WISH the dead and decomposing (probable) whale were something more spectacular, as it looks pretty cool. My first post here, though I’ve been following Mr. Coleman for years. Just want to do my part to support a commitment to a cryptozoology premised on clear thinking and healthy skepticism. 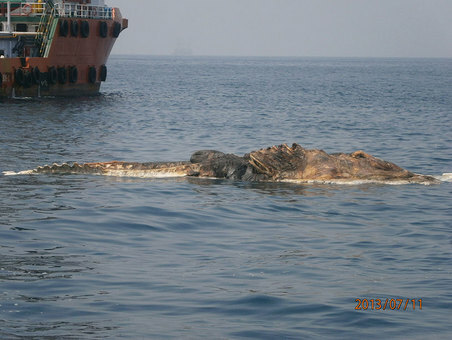 Wow- that is by far the most reptilian looking “whale” I’ve ever seen. As Loren himself and Bernie Heuvelmans have pointed out in their writings, turtles of immense size have been reported on the high seas on occasion. In Cryptoland they are rarely considered as candidates for monsters even though they have many unheralded attributes that should make them the #1 suspect. When I inserted the known characteristics of turtles into Roy Mackal’s chart of probable nominees for the Loch Ness Monster (Monsters of Loch Ness) I was amazed to see that not only did turtles rate higher than anything else on his chart, but that he also did not even consider turtles to be included in the first place. Like Rodney Dangerfield, Chelonians get no respect. Next Entry: What Do You Think Of Two New Bigfoot Videos?